The finished sculpture, “Predator/Prey Constellation,” installed in Franconia’s expanded exhibition space. There is a new form framing the horizon here at Franconia. 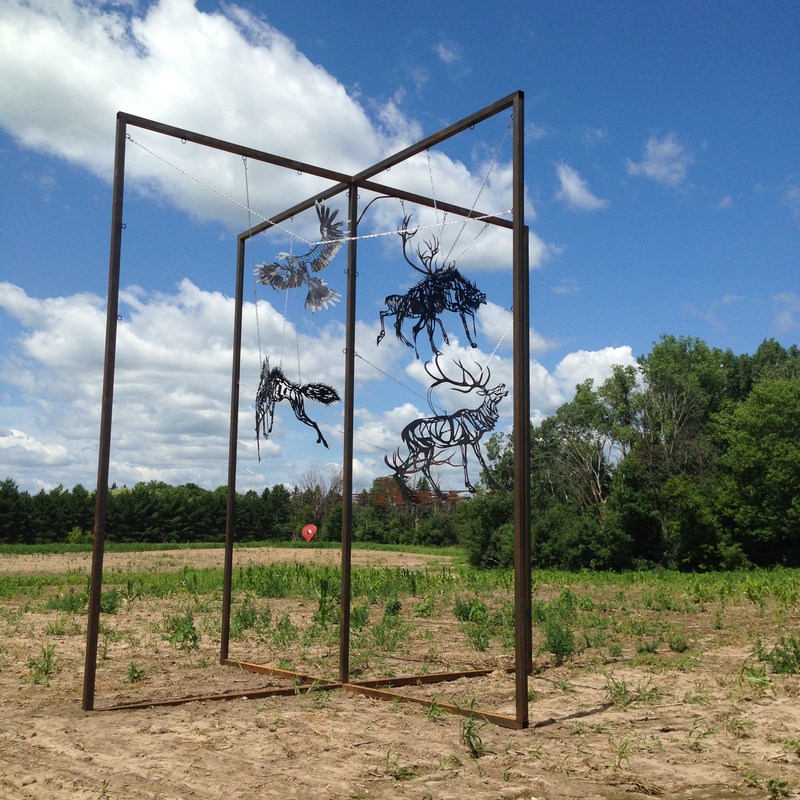 Where there used to be corn fields now stands Predator/Prey Constellation, Open Studio Fellowship Artist Wendy Klemperer’s most recent creation. Her largest work to date, the new sculpture is comprised of seven steel animal silhouettes suspended by chains from a 25-foot, x-shaped support structure. On windy days the beasts sway and clink in the breeze, and when the sun is out they cast shadows across the ground. The work, monumental and raw, is both in line with and unlike any of her past pieces. 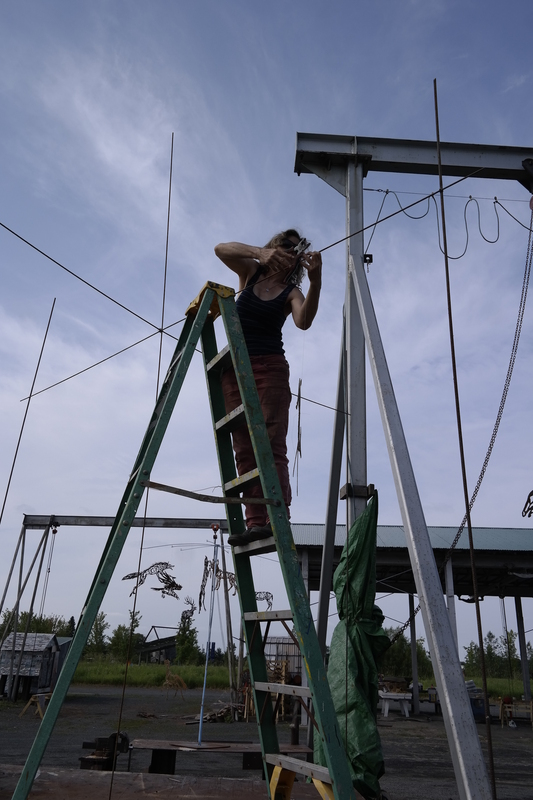 Here, Wendy shares a little bit about her artistic process, her experience at Franconia, and how the two came together to create Predator/Prey Constellation. 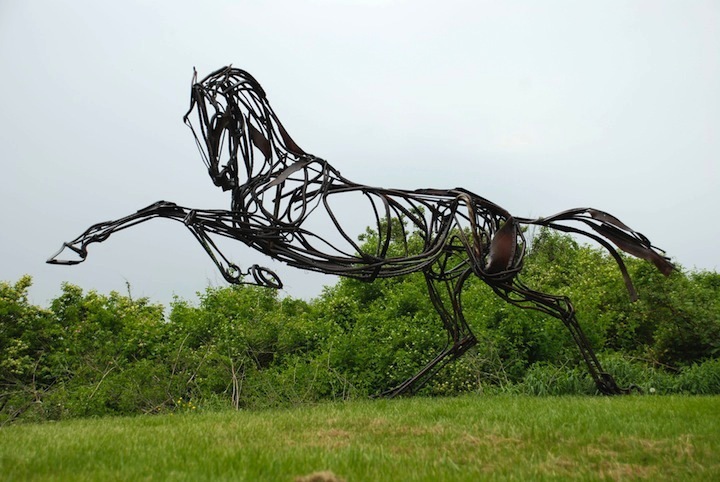 What is your creative process like when you’re making sculpture? It’s like three-dimensional gesture drawing in space. It’s a fast process during which I can draw quickly and edit easily with the torch. Normally I work with salvaged steel from scrap yards and construction sites, mostly rebar because I like the linear quality but anything that has interesting lines will do. 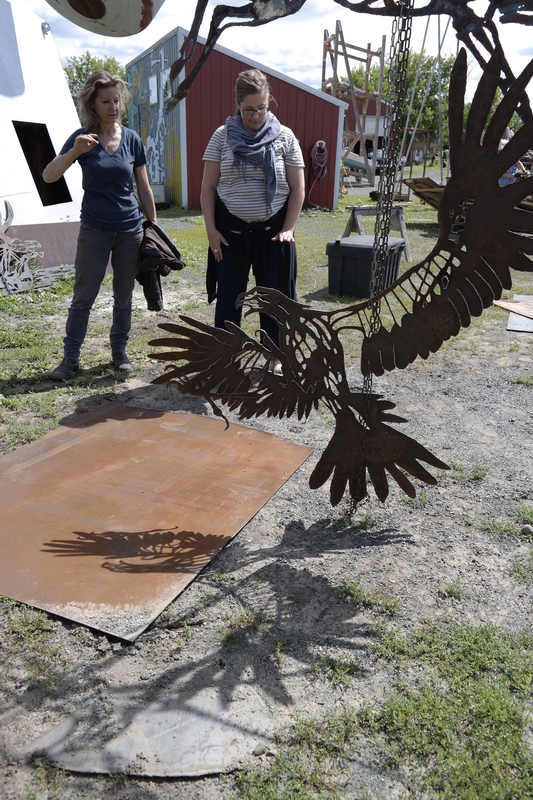 Then I weld up this material into animal imagery that expresses movement through motion and motion through movement. That’s my standard process that I’ve been working with for quite a number of years. The imagery comes partly from my imagination and partially from researching photos and videos of animals on the internet. It comes out of a lifelong interest in nature and animals. To make her Franconia silhouettes, Klemperer traced the shadows created by previous works such as this one from 2006, titled Gericroix. Tell me about your project at Franconia. How does it relate to your past work? I’ve always found the shadows of the sculptures just as interesting and the sculptures themselves, or actually more interesting. I’ve always tried to figure out how to work with that. So this year I delved back into this idea. For my piece here I projected images of my previous sculptures onto the steel and then used a plasma cutter to cut into the steel to create the silhouettes. I was working with these sculptures this winter, just with paper. Projecting light on them and seeing what happened. So that’s what I was working on when I came here. This space is really large. And I felt that trying to weld something up in the time I was here wouldn’t stand up to the space. So I thought of working in this graphic quality. Working in this manner, with this technique, they can be any scale, they are easily enlargeable. So that was my way of being able to work with the sky here and letting them occupy space. This way I was able to hang them and watch them move through space, and working in this way I was able to make 10 of these large silhouettes. I was focusing on making the animals themselves and then realized I needed to work on a way to hang them. So I started making this large frame. Klemperer constructs small-scale models of the structure to get a sense of what final form it will take. Why did you propose your project to Franconia? What did the experience of working here offer? With John Hock’s encouragement I decided to build something larger than I had ever made before. I wasn’t sure what support would work and I was interested in getting into something really complicated. John was helpful in suggesting several possible structures so then I built some models to figure out what structure would work. Once I actually began fabricating the structure it did end up becoming interesting to me. That’s not usually my focus but I realized it can be. I’ve been making sculpture for a long time but now I have new tools and techniques for creating it. I’ve actually applied to Franconia a few times and didn’t get accepted. I didn’t apply this year because I hadn’t been accepted before and I had a lot of other things going on. So when John offered it to me I was shocked and had to try to figure out how to make it work within my life. In other projects I had to stick to a proposal very clearly or had criteria. And I’ve enjoyed that and flourished with that for many years. But here I had the encouragement, and hence obligation, to do something more and change and think and grow without the pressure of having to please anybody. I’ve been wanting that kind of situation for several years and had wanted to apply to places like that but I either hadn’t gotten around to it or what have you, and this was really perfect timing and very refreshing. Where did you study and whom did you study with? How have those experiences influenced your own work? My first sculpture classes were at Harvard University with Dimitri Hadzi, and he’s the person who opened up the world of sculpture to me and is responsible for me becoming a sculptor. He helped veer my life in that direction when I had been studying science before. Klemperer (left) discusses her process with a park guest. And then I went to Pratt Institute. Licio Isolani taught me so much, and helped me with my work for years after I graduated. I also took a foundry class and I only took it because it was a requirement to take some technical class for sculpture. I fell in love with it – working in wax and getting a sculpture ready, and of course pouring molten metal, and chasing. I love the transformation of both iron and metal how they can go from solid to liquid and take on these different forms. I also did a lot of painting when I was at Pratt and I really loved it. I loved abstract painting and I feel like the spontaneity of painting really appeals to me, and it flows over into my sculpture practice. There is a relation between building up my brushstrokes and building up my welded line. Toshio Odate – I did some wood carving with him, but it was more my conversations with him that were influential. We spent a bunch of time talking about evolution and a book called Chance and Necessity. I think he was really interested in the fact that I had studied science before. I was really interested in evolution at the molecular level. We had a lot of conversations about that and he forced me to think a lot about the content of my work and how to find some kind of personal expression through it. Even though he was a great craftsman himself, I think he was pushing me beyond craft to find some content. Jack Sonenberg was a painting teacher. He also was pushing for content. He was really influential to my friends who were painters. That led me to become an abstract painter for about six years. That broadened my vision. How did your time at Franconia compare to other residencies you’ve completed? [At other residencies] you’re in a room, by yourself, and you create. It’s great! But I really enjoyed the open connection to other people’s work around here. It’s funny because the last two residencies I’ve done, at Denali National Park in Alaska and Stanislaus National Forest in California, were solo residencies where I’m basically alone in a cabin in the woods for several weeks. Which was great, but this has been nice to be around a bunch of other artists. I think my favorite residency experience was going to Skowhegan. It was a wonderful experience and hugely influential and a turning point for me. Part of the reason it stayed with me so much was because I was 25 at the time. I was just out of school and soul searching. It was great to be around a bunch of artists all doing the same thing. 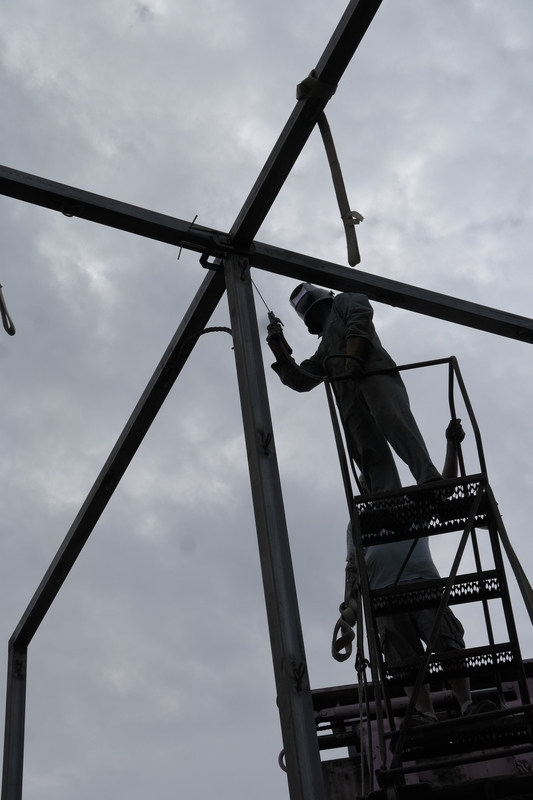 To weld the last piece of her frame structure, Klemperer had to be lifted 25 feet into the air. I wasn’t sure if I could have a similar experience again but one of the best things about being here has been the immersion with other people, both socially and artistically. I didn’t know if I was going to have that experience again; it’s been surprising. Is there anything else you’d like to add? It’s beautiful here. I had no idea it was so beautiful here with all the rivers and lakes. It’s pretty wonderful to be in this location. And driving out was actually a good thing. I hadn’t been looking forward to it but I actually enjoyed it a lot. Working with the interns was really positive. Everyone was really positive and ready to help and interested. Klemperer’s Predator/Prey Constellation can be viewed 365 days a year, from dawn to dusk – come see it for yourself and #startseeingsculpture! Franconia Sculpture Park’s Artist Residency Program is made possible through generous lead support provided by the Jerome Foundation, Windgate Charitable Foundation, the National Endowment for the Arts, and Woodbury Foundation, with additional support provided by the Sustainable Arts Foundation, Sage Cleveland Foundation, and RBC Wealth Management, and many generous individuals.